Greetings children! Hope April is keeping you in good health and joyful spirits. If you are looking for a bit more happiness, today’s topic will literally fill you with joy. 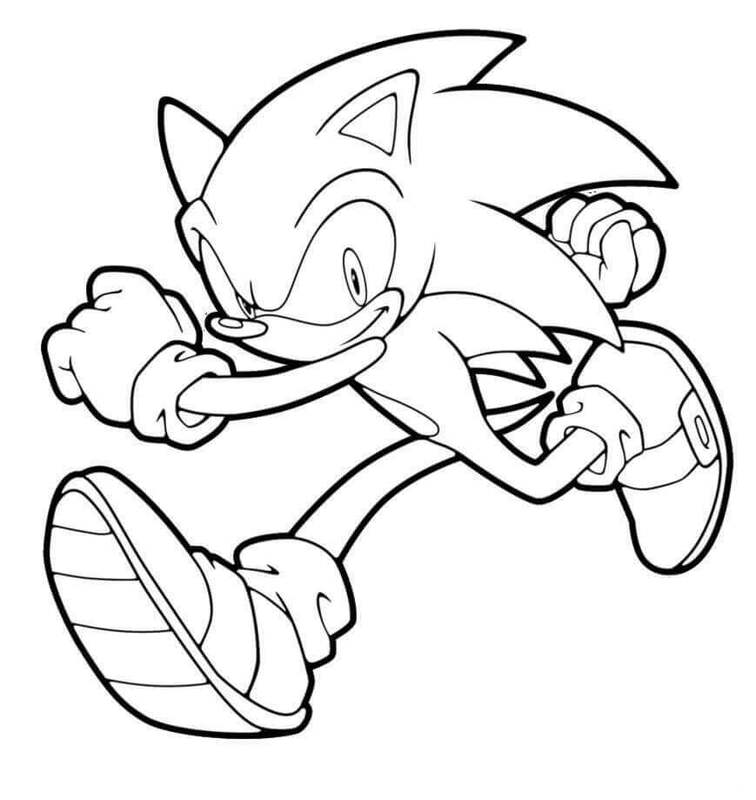 Today, we have a collection of free printable Sonic the Hedgehog coloring pages inspired by the ever-popular video game of the same name. 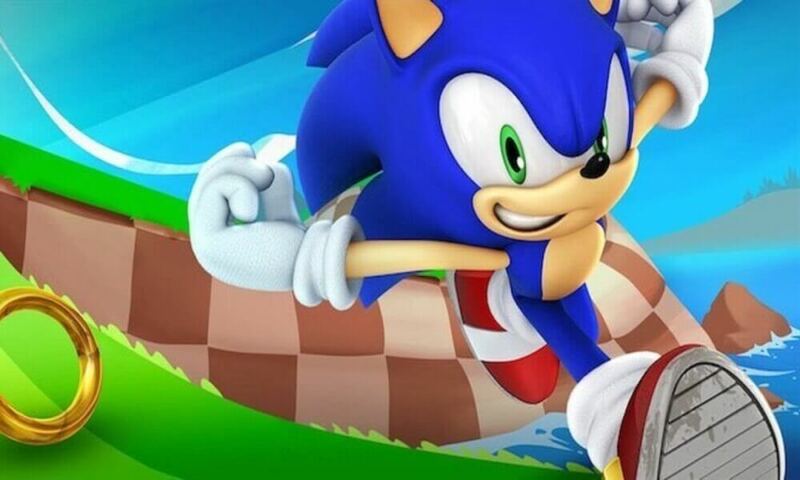 First introduced in 1991 by the Japanese company, SEGA Games Co., Ltd., Sonic The Hedgehog is a game about an anthropomorphic or human-like blue hedgehog having supersonic speed. He fights against his archenemy, a mad scientist, Doctor Ivo “Eggman” Robotnik who plans to rule the world using robots. The game has been adapted into different media like television series, comics and even films. A live-action animated film is set to release on November 8, 2019, starring Jim Carrey as the villain Dr. Eggman. 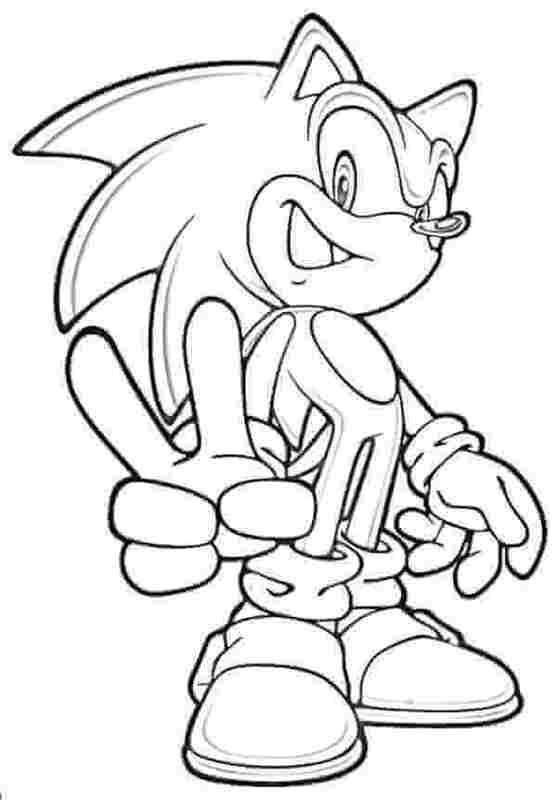 Let’s discover the world of Sonic the Hedgehog and its different characters through this collection of Sonic The Hedgehog coloring sheets to print. 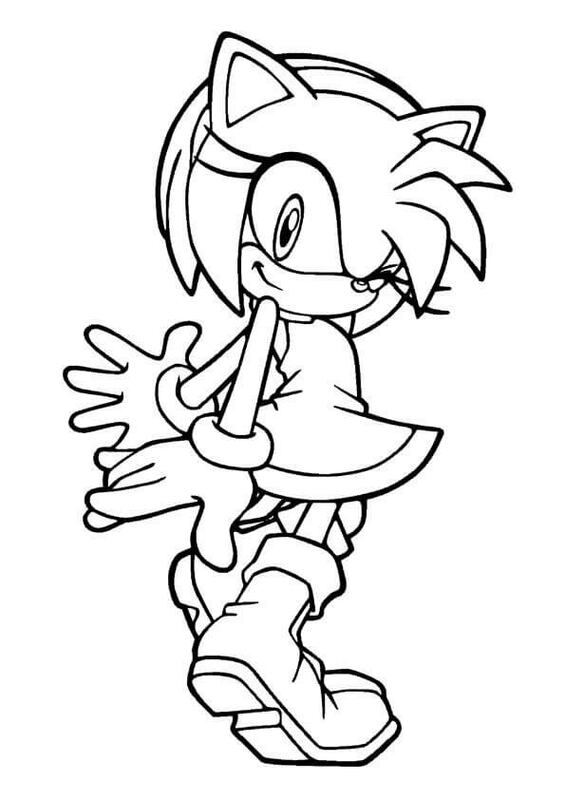 When it comes to Sonic The Hedgehog, Amy Rose can never be far behind. She is also a hedgehog herself and you will always find her following Sonic, proclaiming her love for Sonic. She uses a hammer to fight off the enemies. Print this page and give this sweet and strong character some of your best colors. There is an overload of cuteness on this coloring page. Sonic and Amy Rose are little kids in his illustration. 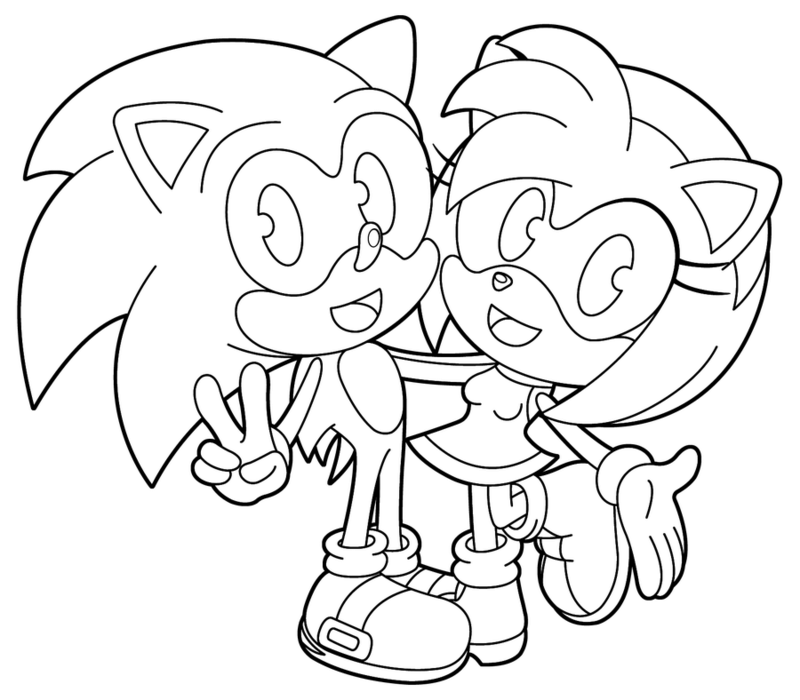 Shower some colorful love on these cuties – baby Amy and baby Sonic – by quickly printing and coloring this page. Here is another illustration of Sonic as a kid, this time playing with his toy car. He seems to have loved toy cars when he was a baby Sonic. It’s no wonder he grew up to be a super speed hero. You can think of the first few toys you played with while you print and color this page. Purple in color, Big the Cat is huge in size and always on a lookout to save his friend, Froggy. You can see him carrying a fishing rod. He uses it to try and fish out Froggy from the water. 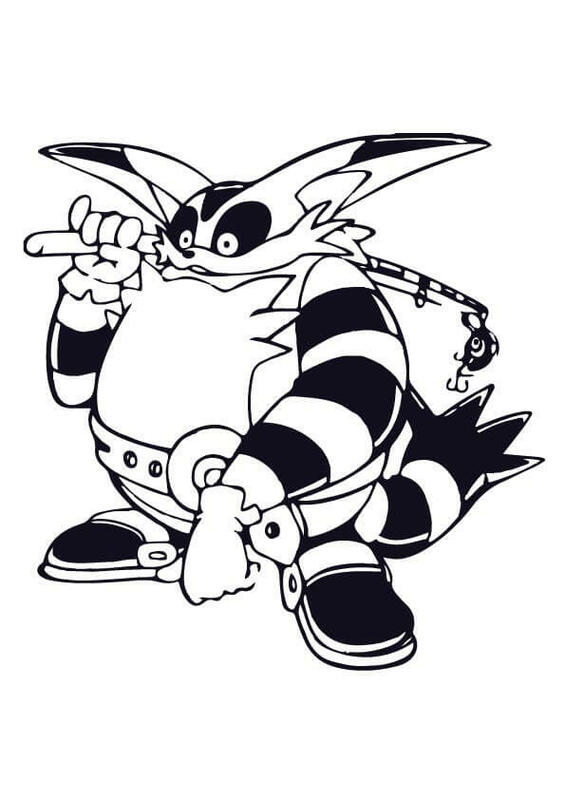 Although the character has been discontinued since 2012, Big the Cat makes some rare appearances here and there. Give your homage to this character by printing and coloring this illustration in accurate colors. Created as the “Ultimate Life Form” by Dr. Eggman’s grandfather Professor Gerald Robotnik, Shadow The Hedgehog is very similar to Sonic in design and some powers but differ majorly in their mindsets. 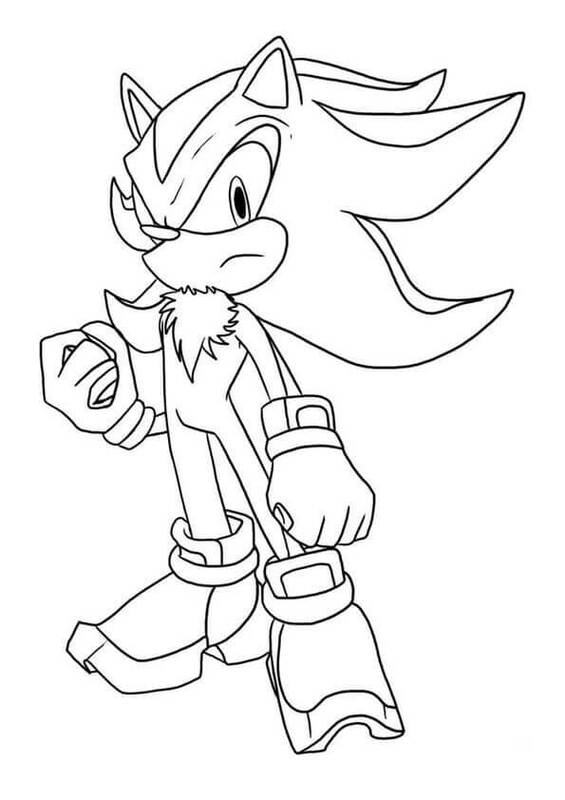 Unlike the blue on Sonic, Shadow is black in color and can become almost invincible if he gets the Chaos Emeralds which comes with mystical powers. Belonging to an alternate dimension to the world of Sonic The Hedgehog, Blaze The Cat is a cat princess with the ability to control fire. She acts as the guardian of the Sol Emeralds, similar to the mystical Chaos Emeralds in Sonic’s world. Like Sonic becomes Super Sonic after achieving all seven Chaos Emeralds, Blaze turns into Burning Blaze. Give this fiery princess some royally fitting colors. Looks like our hero Sonic The Hedgehog has come up with a brilliant idea to fight his enemies. Wonder what his mind came up with this time! Pretty sure, it will be full of adventure and action. Capture the movement of his fingers and the glint in his when you print and color this illustration. Peach in color, Cream The Rabbit is seen here introducing you to Cheese, her constant companion. Cheese is a Chao which are fictional childlike life forms existing in various physical forms. Cream has exceptionally large ears which let her fly for a short while. Imagine being able to fly like her while your color this page. Wanting to fill the world with only robots, Doctor Eggman is in search of the seven Chaos Emeralds to gain the power and the ability to turn all the animals into machines. He is the main enemy, the nemesis of Sonic The Hedgehog. Doesn’t he look formidable in his illustration? Even heroes need to chill out when it gets hot in Summer! There is nothing better than to sip on your cool lemonade and sit down with sunglasses on. If it is getting warmer in your area, you can get inspired by Sonic to relax in the heat. When you know you are good at something, you stand strong and confident. Sonic, the Hedgehog, is confident of his powers and his ability to withstand any enemies. 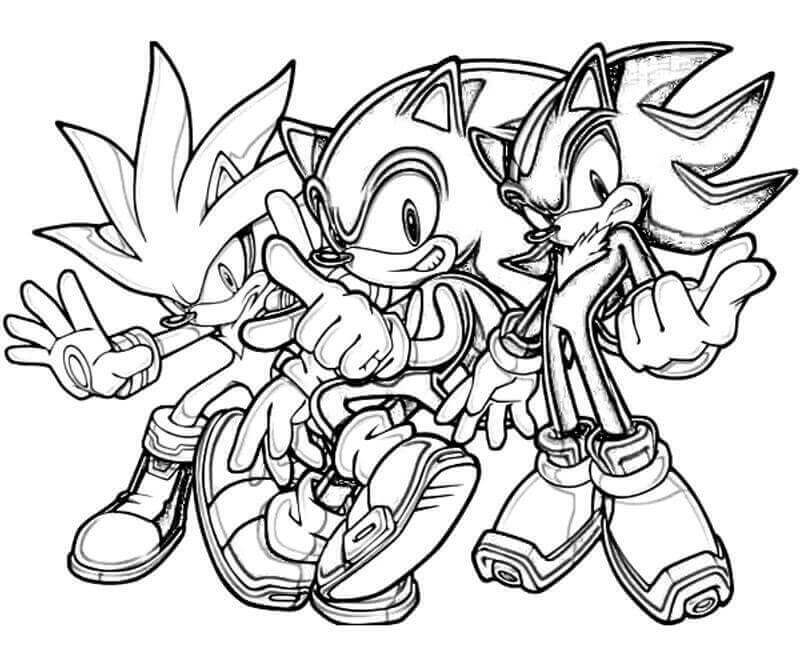 Print this page with the cool and confident Sonic illustration and give it your full-on colors. When Sonic The Hedgehog has found all the seven Chaos Emeralds, he transforms into Super Sonic, his golden avatar. 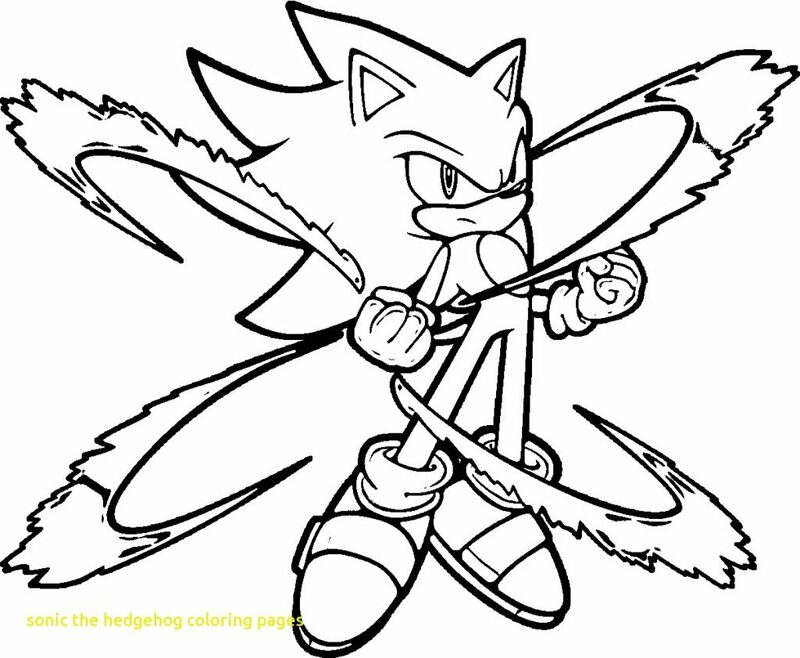 In this transformed form, Sonic gains the ability to fly, apart from achieving faster speed and greater strength. Give this golden boy some pure gold colors after you print this page. Always actively looking out for clues and ways to defeat his enemies, Sonic makes use of any opportunities he gets. When Sonic gets hold of the Super Emeralds, these are Chaos Emeralds enhanced by Master Emerald, Sonic turns into another form, Hyper Sonic. 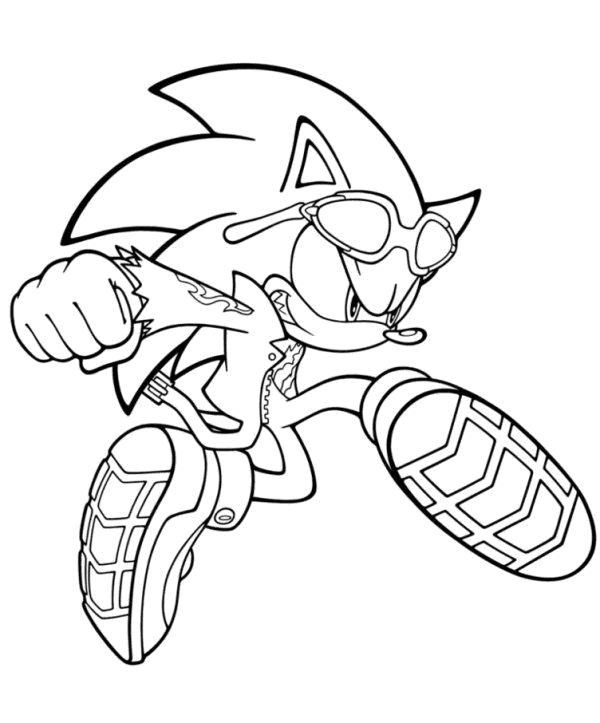 Be calm and cool as you color this Hyper Sonic illustration. Living on a floating island in the air called Angel Island, Knuckles The Echidna is the last surviving member of his kind. The island floats with the help of the Master Emerald, an emerald which has the power to control all seven Chaos Emeralds. Trained in several martial arts, Knuckles fiercely performs his duty of guarding the Master Emerald. 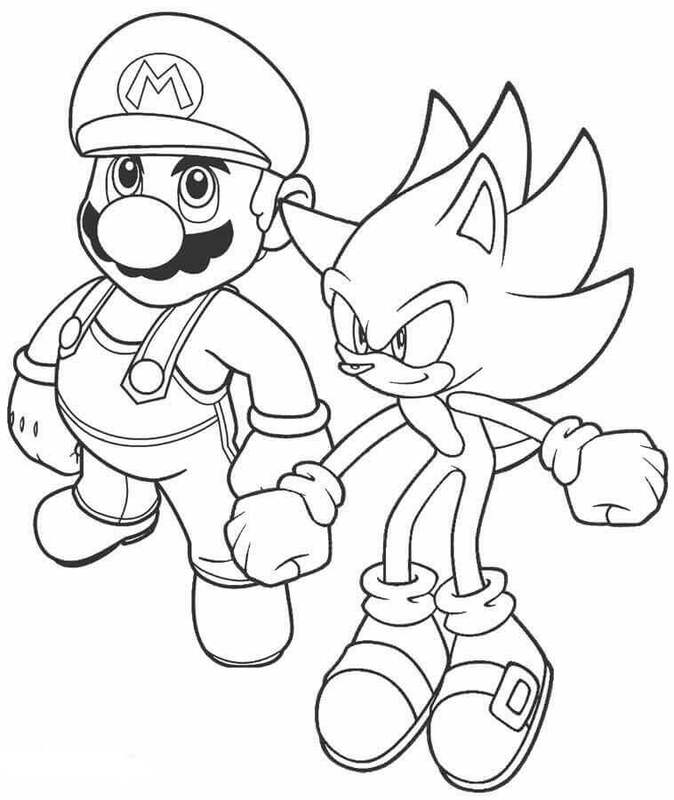 The two rivals, Nintendo’s Mario and Sega’s Sonic come together in this illustration and in various Olympics inspired games. Ever since Sega stopped manufacturing game consoles, they started creating games for Nintendo’s consoles too, leading to the Mario & Sonic series. Capture this historic moment with your best coloring skills. 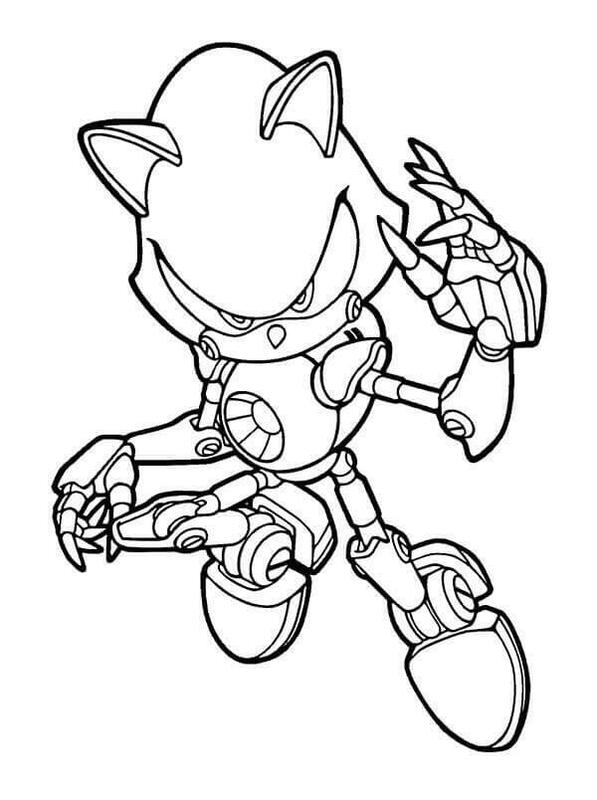 Metal Sonic is a robot created by Doctor Robotnik. He was designed as an evil version of Sonic, having great strength. Using a force field device Metal Sonic can safeguard himself from certain attacks. But he will surely welcome your colors. 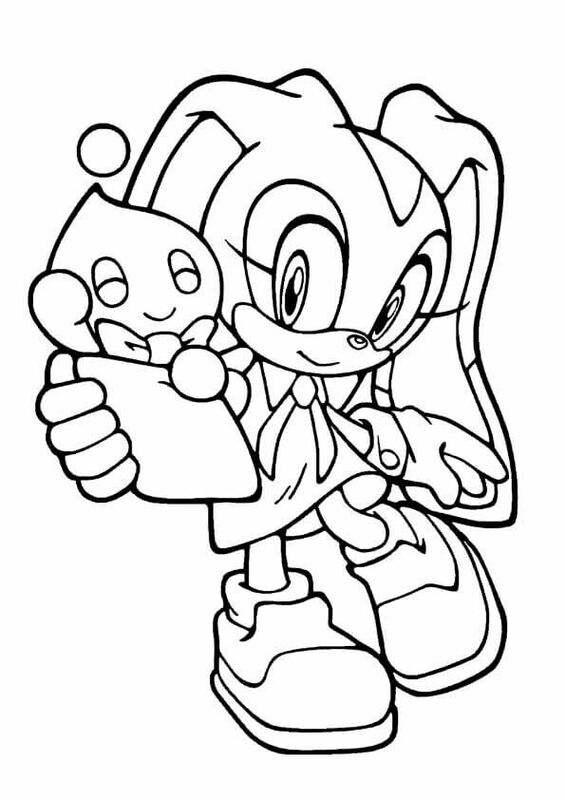 Take a print out and start coloring this page. Always there by Sonic’s side as his best friend and sidekick, Miles Prower is a two-tailed fox, popularly known as Tails. Using his two tails he is able to fly like a helicopter for a short period of time. If you start now, it will take you a short amount of time to color this page too. 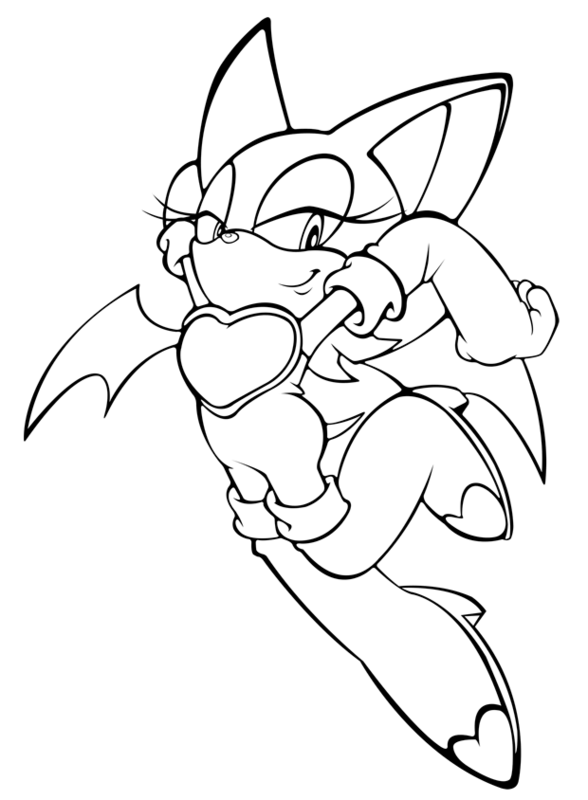 A treasure hunting anthropomorphic bat, Rouge The Bat first appeared in 2001 game “Sonic Adventure 2”. She is known to be focused on finding jewels and fights off her opponents with kicks. Because of her wings, she is able to fly effortlessly. You too can effortlessly sail through coloring this illustration with your brilliant coloring skills. Doctor “Eggman” Robotnik’s grandfather, Professor Gerald Robotnik had created Shadow The Hedgehog more than fifty years ago in the hopes to save his granddaughter Maria Robotnik. Once created, Shadow and Maria develop a close bond. Shadow’s friend Maria had died in an attack and it deeply affected him. Before her death, she made Shadow promise her to save humanity. In his efforts to keep this promise he joins in with Sonic, becoming a friend from an enemy. 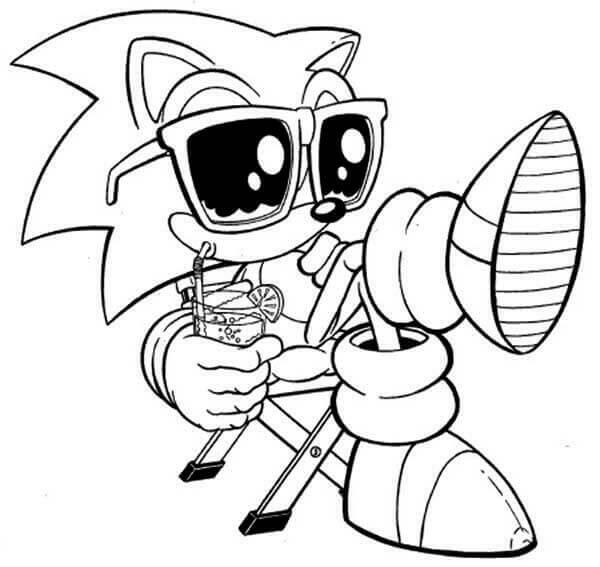 Once he’s done saving the day, Sonic can’t help but look relaxed and super-cool. This must be one of the favorite poses of the millennials, holding up the peace sign or perhaps victory. Whichever way you interpret the sign, one thing is for sure, Sonic always wins our hearts. Ready to fight and battle it out, Sonic has come prepared to save the day and defeat his enemies. 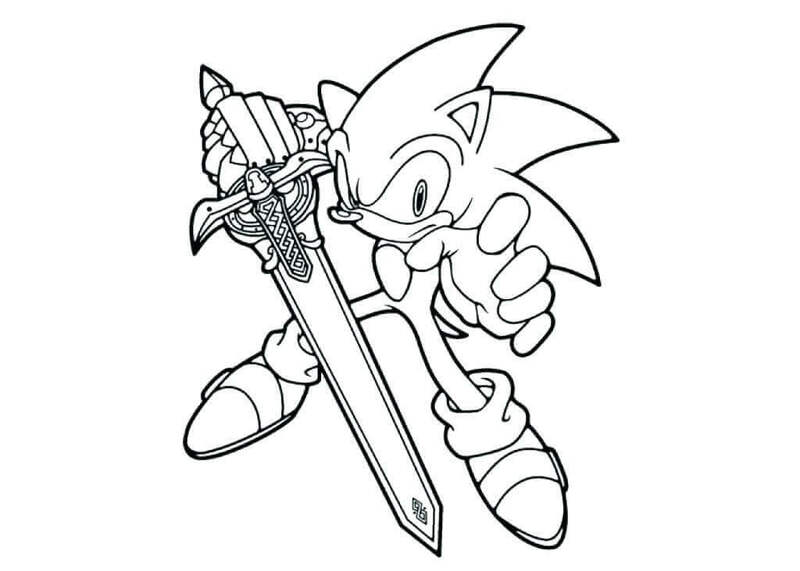 Looking at the illustration, no one would dare mess with Sonic. Up close the sword looks so deadly. Print this page and give this action hero your best colors. From two hundred years in the future, Silver The Hedgehog comes back in time. The world in the future has been destroyed and he believes that Sonic The Hedgehog has something to do with it. 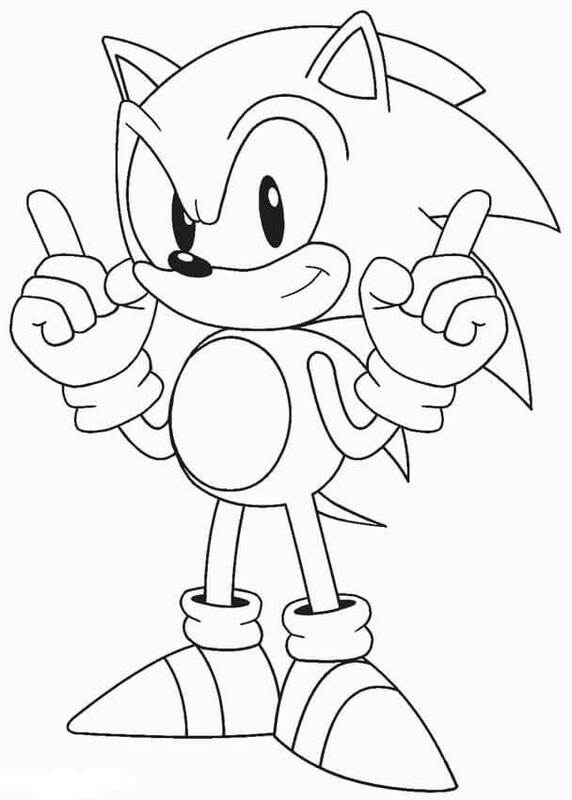 Print this hedgehog from the future and give him some of your futuristic colors. One of the several animated television series inspired by Sonic The Hedgehog, Sonic Underground was released in 1999. 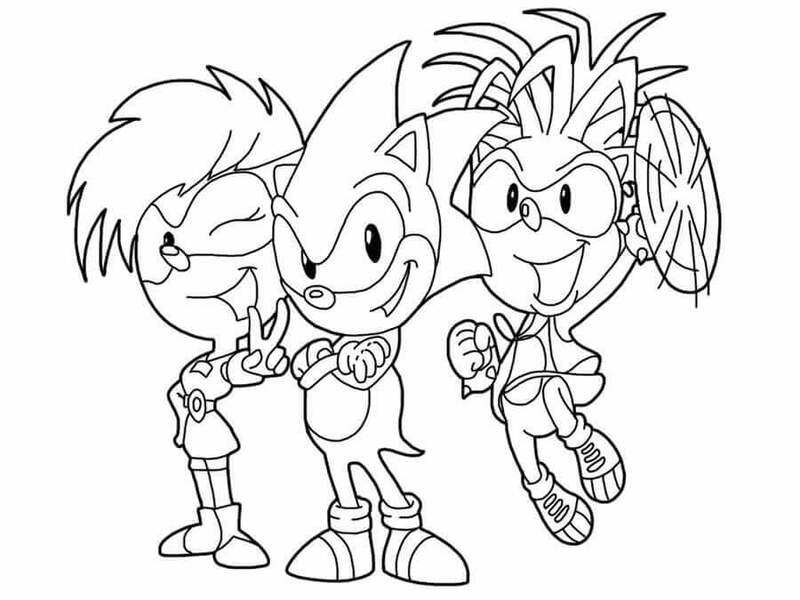 You can see the three main characters in this illustration – Sonic, his brother Manic and his sister Sonia – posing adorably. But don’t let their cuteness fool you. They are full of power. This 2008 game, “Sonic Unleashed”, saw the world being shattered by Doctor Eggman and Sonic The Hedgehog trying his best to restore it. Doctor Eggman’s shattering of the world unleashed a dark and evil force, Dark Gaia. Encountering the Dark Gaia brings about the monstrous “Werehog” transformation in Sonic. Here is Sonic The Hedgehog in his Super Sonic form, mustering up all his power and strength, ready to attack. There is a determined look in his eyes and courage in his stance. Give this illustration all your love by printing and coloring it with proper colors. There is always great teamwork, helping each other through all the trials and tribulations, all missions and assignments. 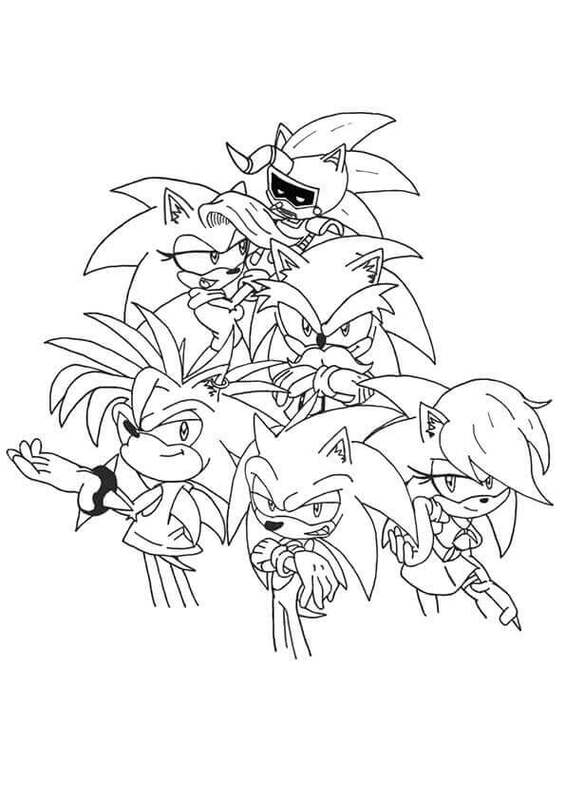 This illustration showcases some of the members of the Hedgehog family. You don’t want to mess with the Hedgehog family, for sure. A close-knit team that always has each other’s back in their times of need. Even their individual poses complement each other in this illustration. 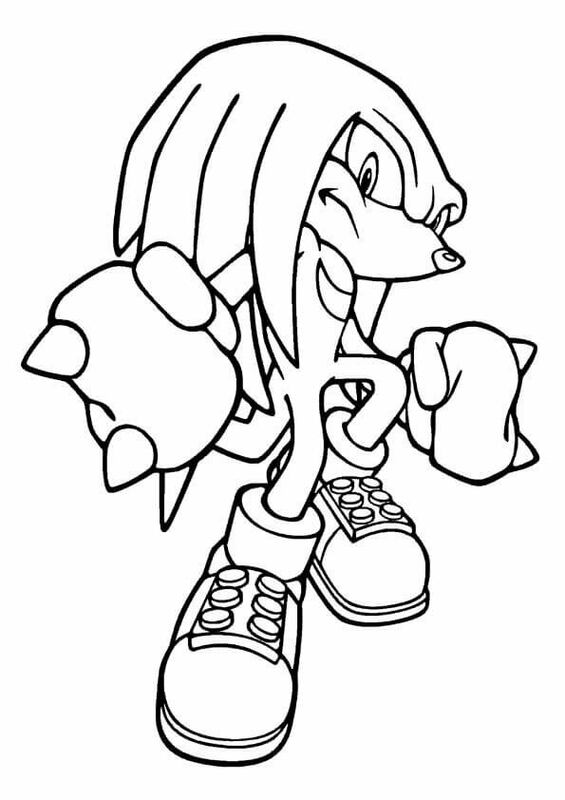 After you print out this coloring page, be prepared with a different set of colors for each one of the awesome Hedgehog team. Part of the Japanese anime television series “Sonic X”, Topaz is a human character working as a federal agent. She has been assigned to work together with Rouge The Bat and Knuckles The Echidna, by the president, to stop Doctor Eggman who is planning to take over the world. “Sonic Unleashed” showcased how Doctor Eggman managed to trap Sonic, firing a ray at him draining the Chaos Emeralds. This leads to an unexpected and corrupted change in Sonic and he transforms into a werehog at night. 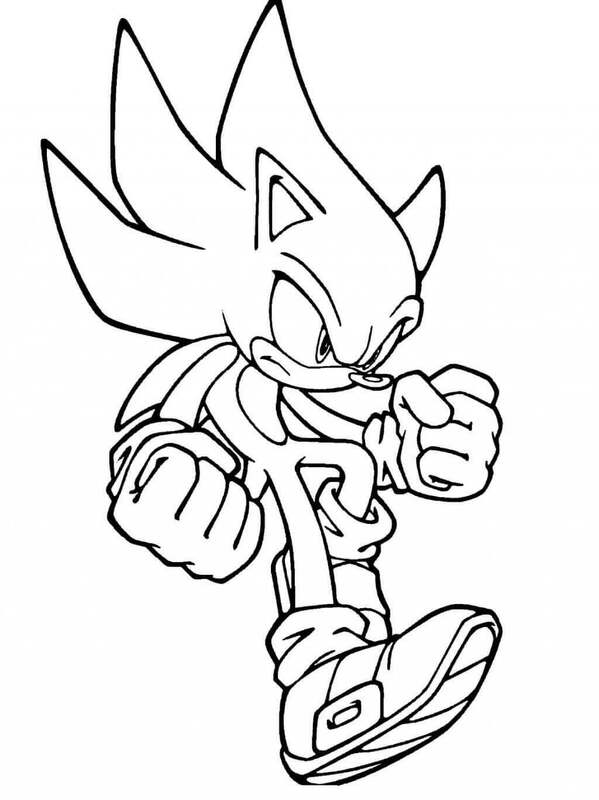 Be sure to catch all the minute details of his illustration when you start coloring this page. 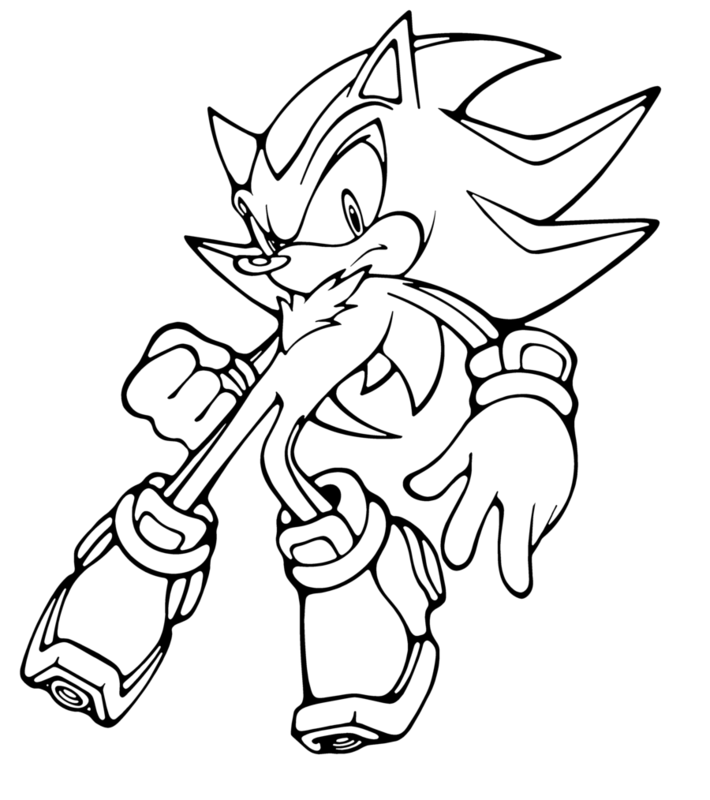 On that unexpected note, we have come to the end of today’s collection of Sonic The Hedgehog coloring pages to print. If you enjoy playing video games, you must have enjoyed this collection. In case you are not familiar with this game, you can ask your parents or teachers or even some of your friends. Sonic The Hedgehog is one of the bestselling and critically loved games. If you’re more into movies, then be sure to catch the live-action animated movie releasing at the end of the year on November 8. 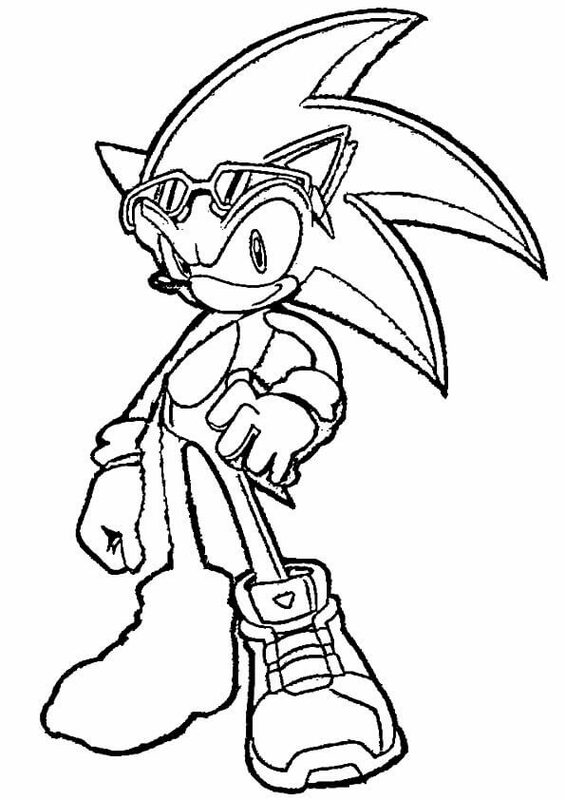 Meanwhile, have fun coloring this collection of Sonic The Hedgehog coloring pages printable.